As we approach 9/11, we remember all those who lost their lives trying to save others’ on such a tragic day in American history. We also commemorate the first responders who arrive at traumatic scenes every day. In York County, the Safekeepers Shrine at Prospect Hill Cemetery serves as a memorial to all those who put themselves at risk to ensure our safety, including firefighters, police officers and emergency medical personnel. When visiting the shrine, you’re welcomed to sit on the bench we sponsored to salute those who serve and protect. 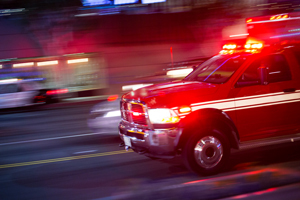 As personal injury attorneys, we hear the stories of people involved at tragic incident scenes, and we appreciate the first responders who often put their lives on the line to help those in need. That’s why we wanted to share how you can help first responders. If you happen to be on the scene of an incident, whether as a victim or an eyewitness, here are five ways you can assist emergency personnel. Stay calm. Take deep breaths and look away from the scene whenever necessary to keep your body relaxed and avoid traumatic shock. First responders will tend to those critically injured first, so it’s important to keep yourself as calm as possible until they can get to you. Remaining calm will also help you to answer questions from police officers, medical personnel, firefighters and others, to the best of your ability. Take pictures. We’ve mentioned it before, but it’s critical to take detailed photos following an incident. It’s likely that emergency personnel will also take photos, but yours could be the difference between a traffic violation or a false injury claim. If you’re in a car accident or you experience a fire at your home, you can often return to the scene after the incident to take additional photos. Jot notes. In addition to taking photos, record your memories of the incident as soon as possible. Beyond the basic facts (what happened), include descriptions of all people, places and objects involved. If you don’t have time to write this information, use a recording device (you could even use an app on your smartphone) to speak what you saw. What’s most important is that you record what you remember soon after the incident. Here’s why. Remain at the scene as long as necessary. DO NOT leave until first responders give you the OK to do so. They need information from all people on the scene to piece together what happened and fill out proper reports. This may take several hours, depending on the severity of the incident. Comply with all directions as best you are able, but NEVER admit fault. Yet, stay out of the way. We’re sure you’ve heard before, don’t run into a burning building. You should always wait for first responders to arrive, who are professionally trained to evacuate the premises. Otherwise, first responders may then have to rescue everyone else AND you. Similarly, at the scene of a car crash, if possible, move your car to the nearest location that will not hold up traffic. Even if a friend or relative is in danger, comply with first responders’ directions and trust that they will handle the situation to the best of their ability. If you or someone you know has been injured due to someone else’s negligence, contact KBG to discuss your possible options, and get the Results You Deserve®.